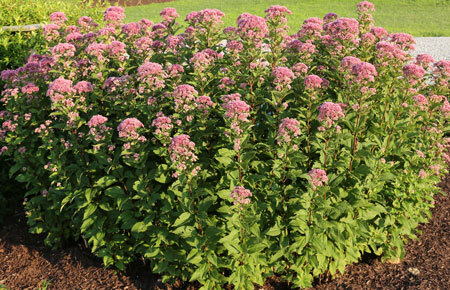 Joe Pye Weed is named after a legendary Colonial-era Native American healer, Joe Pye. According to the legend, Joe Pye used the roots of this plant to cure typhus by inducing sweating. The earliest recorded use of this name dates to 1810–1820. Its former name, gravel root, refers to the kidney stones the weed was thought to cure. It was also used as a diuretic as well as to treat rheumatism, gout, fevers, diarrhea, respiratory disorders, infections in wounds, impotence and as an overall general tonic. It would seem a Joe Pye weed in the yard would eliminate a need for anything in the medicine cupboard. 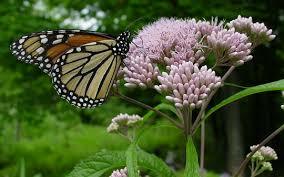 Modern science, however, has not established that the Joe Pye weed has any efficacy for any ailments. Now it is grown mainly as an lovely addition to the landscape and to attract birds and butterflies. ​The Joe-Pye weeds are from the genus Eupatorium, named in honor of Mithradates VI Eupator, the king of Pontus (in the area of present-day Turkey) who died in 63 BC. King Eupator was one of the first to study the art of poisoning and antidotes. He is said to have immunized himself against poison by taking increasingly large, nonlethal doses (just as Wesley built up an immunity to Iocane in Princess Bride). ​Eupator was said to have experimented with a plant from the genus that now bears his name, but there are about 40 different species in that genus. Most of them are tropical perennials but there are about five species in North America. These plants crossbreed freely, making identification a challenge even for botanists. ​The weeds are all tall, erect herbs with leaves arranged in whorls on the stem. The flower heads are generally large, domed or flat-topped clusters of small purplish tubular disk flowers. The species may differ slightly differ in leaf shape and veining; appearance and numbers of flower clusters and the hairiness and color of the stem Spotted Joe-Pye weed (E. maculatum) has stout, speckled or purplish stems. Hollow-stemmed Joe-Pye weed (E. fistulosum), not surprisingly, is known for its hollow stem. Sweet Joe-Pye weed (E. purpureum) has a solid stem. It’s know for a sweet vanilla-like odor. The Steele’s Joe-Pye weed (E. steelei) have hairier and­broader stems and leaves than the other varities. The leaves of the Three-nerved Joe-Pye weed (E. dubium) have two large veins and are somewhat bumpy. 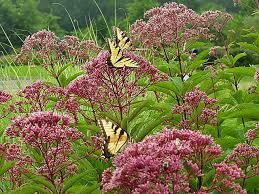 ​But to the most people, they are all just “Joe Pye Weed.” All of them bloom from July to September and attract butterflies to gardens throughout the United States and all make good cut flowers. They can grow as tall as seven feet with a six foot spread so they are best planted the back of the garden with plenty of space.